Still relatively unique in the hobby, 2016 Panini Playbook Football is a hit-centered release with a fixation on booklet cards. Likely a familiar sight for NFL collectors as the brand has seen consistent production for several years, collectors can find one book in every box along with an additional hit card. With just three cards per box, the base set is hardly the main focus but it remains relevant as it occupies 1/3 of each box. 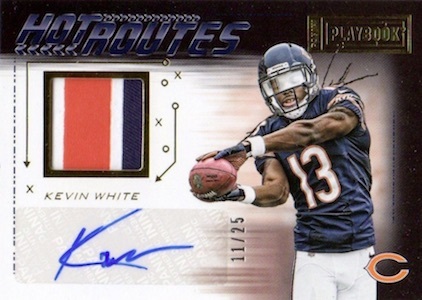 Still, the hits are what draws interest to 2016 Panini Playbook Football and the product has several. Mixing relics and autographs, 2016 Panini Playbook Football booklets come in multiple forms and average one per box. Rookie Playbook Jersey Autographs showcase the 2016 draftees and Playbook Material Autographs include multiple memorabilia swatches and a signature. 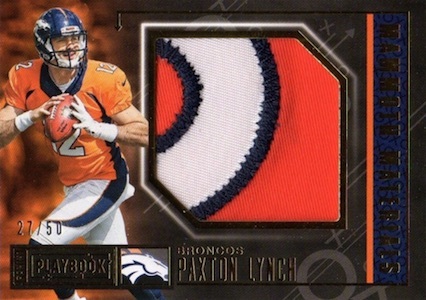 The rookie-centered books also has Glove Logo, NFL Shield and Nike Swoosh parallels. Front 4 Jersey Signatures Booklets up that to a quad format with both autographs and relics. 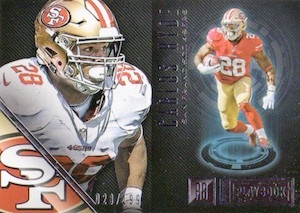 Although book cards are a main feature of 2016 Panini Playbook Football, and part of the product's name, standard hit cards also drop in every box. 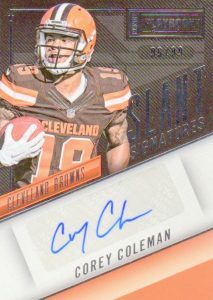 Among these are Coaches Quotes Autographs and Slant Signatures for individual players as well as Play Action Autographs that offer multiple signers on one card. Split 6 Signatures is another multi-signed option. Lastly, relics get special treatment in 2016 Panini Playbook Football inserts such as Armory multi-swatch, Mammoth Material and Red Zone. Continuing with the book cards, Face 2 Face combines two players on the same card with relics for each while Passport Book contains two oversized memorabilia pieces for the same player. 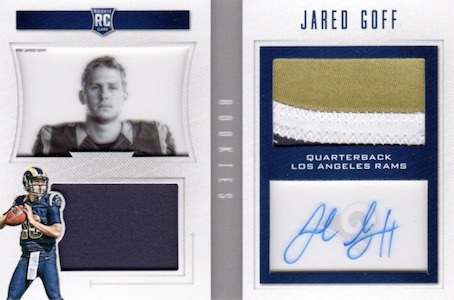 There are also Rookie Jumbo Memorabilia Booklets and Playbook Booklet Materials to track down. BOB LILLY 2016 PANINI PLAYBOOK AUTOGRAPH AUTO #6 49 -COWBOYS!!! 100 cards. Serial Numbered #/199. PARALLEL CARDS: Platinum #/49, Green #/25, Red 1/1, Printing Plates 1/1. PARALLEL CARDS: Gold #/99 or #/75, Platinum #/49, Green #/25, Red #/10, Glove #/5, NFL Shield 1/1, Nike Swoosh 1/1, Printing Plates 1/1. 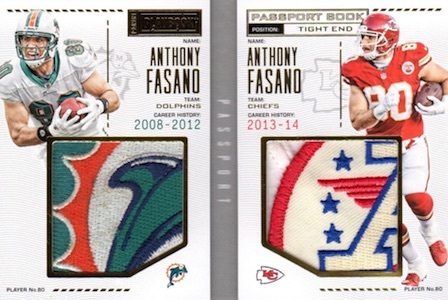 PARALLEL CARDS: Prime #/25, NFL Shield 1/1, NFLPA Tags 1/1, Nike Swoosh 1/1. PARALLEL CARDS: Gold #/25 (*Card #3 - #/10), Holo Gold 1/1. PARALLEL CARDS: Prime #/10 (*Card #4 - #/5), Nike Swoosh 1/1. 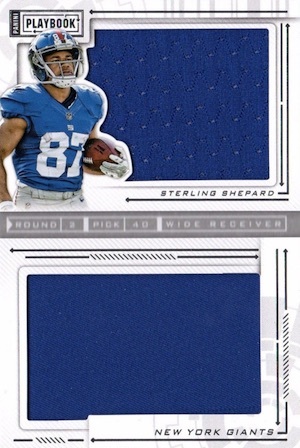 PARALLEL CARDS: Prime #/25 or #/10, Brand Logo 1/1, NFL Shield 1/1 (*No card #11), Tags 1/1 (*No card #11). PARALLEL CARDS: Prime #/5 or 1/1 (*No card #1), Tag 1/1 (*Only for card #3), Printing Plates 1/1. PARALLEL CARDS: Prime #/10 or less, Tags 1/1. All subjects not included in Tags parallel. View specific options with the full spreadsheet. 34 cards. *Card #18 found only in Prime. PARALLEL CARDS: Prime #/50 or less, Tags 1/1 (*No card #2). PARALLEL CARDS (*No card #1): Prime #/25 or less, Tags 1/1. 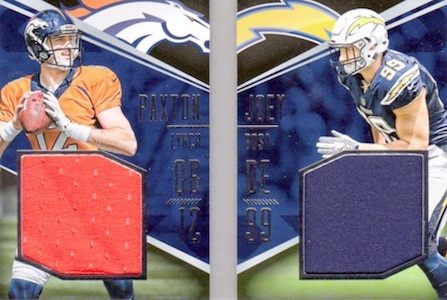 PARALLEL CARDS: Prime #/50, NFL Shield 1/1. 11 cards. *Card #9 found only in Prime. PARALLEL CARDS: Gold #/10 (*No card #5), Holo gold 1/1. 21 cards. *Card #14 found only in parallels. PARALLEL CARDS: Gold #/25, Platinum #/10, Green #/5 (*Card #22 - #/3), Brand Logo 1/1, NFL Football Shield 1/1, NFL Shield 1/1. All subject not included in parallels. View specific options with the full spreadsheet. 39 cards. *Cards #18, 24 found only in parallels. PARALLEL CARDS: Gold #/99 or #/49, Blue #/49 or #/25, Green #/25 or #/15, Red #/10 or #/5, NFL Shield Black 1/1, Nike Swoosh Black 1/1, Printing Plates 1/1. 20 cards. Serial Numbered #/149. 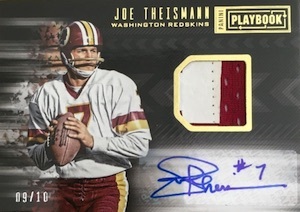 PARALLEL CARDS: Prime #/25, Complete Logo 1/1, Drawn Play 1/1, Gloves 1/1, NFL Shield 1/1, Nike Swoosh 1/1. All subjects not included in Complete Logo parallel. View specific options with the full spreadsheet. PARALLEL CARDS: RPS Team Photo #/5. PARALLEL CARDS: Gold #/25 or less, Holo Gold 1/1. PARALLEL CARDS: Black 1/1, Printing Plates 1/1. PARALLEL CARDS: Prime #/50 (*Cards #1 -#/25, #5 - #/10; No card #12), Tags 1/1. 4 Stars. Teriffic selection of players, formats, and levels. Unique booklet configuration and plenty of 1/1’s. Exciting break!! !